Hi everyone, it's Ellie Knol with you today, and I'd like to share with you the making of some home decor, to be precise: an MDF board with 49 MDF inchies (sized 1,5 inch each) with reinkers, tissuepaper and the beautiful stamps from Sarah Naumann! Creating something for this theme was a bit tricky, as I wanted to use pigment ink reinkers of for a technique that could not be done with a regular (pigment) ink stamp pad. Also, I had to think of using it with these beautiful stamps and enhance both of course!! I had it all finished a week ago but had to start all over as I did not like the first one I created. I had to scrape everything off, and sand and paint all those little squares first!! My husband told me I was crazy; maybe I am a, but I do like this one more than the first one, and that's why I did it again! This is a close-up of the first one I did, I certainly did not like the stencilled squares on this project, they were too prominent. As you can see I chose to use only the blue pigment ink for version 2, not the green. I like the contrast between the Ginkgo leaves and the blue so much this way, and I wanted it to look like this from the start. As soon as I added the green color on the first project, it started being too much, I was left with less white parts of the initial white background. This is way better!! Let's start on this project! I used tissue wrap paper, approximately the size of the project, a tiny bit bigger. I stamped the beautiful stamps from ESN20 with Versamark ink and heat embossed it with white embossing powder. (PS .. I laid it on a darker piece of cardstock so the embossing would be visible on the photograph above). I had prepared the MDF base with white gesso and a layer of Snowflake Fresco Finish Acrylic Paint. LOVE this paint, one layer is enough to cover it, it's that opaque! I adhered the tissue paper to the project with decoupage glue, by brushing the glue onto the surface (also between the inchies) and pressing the tissue paper onto it with a damp cloth.... ... SO, there is no glue on top of the tissue paper. I did this on purpose, You'll see why in the next step. I used a sturdy (dry and clean) brush to push the paper inbetween the inchies (yes it will tear, but that's OK) , and used a ruler to press the paper to the sides of the MDF inchies. Of course this needs to be dry before the next step. Now for the fun part: adding the reinker! Brayer a fair amount of Colorbox Cyan pigment re-inker onto a gel-plate, and brayer it sparingly onto the project. Don't cover the whole background but just partially. Re-ink the brayer every time from the gel-plate and brayer over a different part of you project until you are satisfied with the result. Certainly don't overdo this step. The pigment ink gets soaked up mostly by the tissue paper; more than it would have if I had covered the tissue paper with decoupage glue in the previous step. A close-up of the brayered pigment ink. Leave it to dry completely. Don't use a heat tool or else if the embossing powder re-melts, then you will tint the white embossing with the blue ink permanently. You may carefully use the heat of a heat tool to dry it from a distance, though. When totally dry, wipe over the white heat embossing carefully with a damp cloth to clean up so the words pop and are more obvious. On this photograph I was laying out the leaves to see where I wanted to glue them down, and whether I would add some more brown-red stamping first. I Covered the leaves with 2 layers of Fresco Finish - Gloss Glaze to make them more sturdy and glossy. I chose to stamp the words 'garden' and 'love' from the same stamp set in a brownish red to match the Ginkgo leaves; only horizontally on the height of the leaves, to give them kind of a base. I used the same ink to outline the outside and inside border of the project. And then I adhered the leaves to the project with a hot glue gun. Cover up the leaves and splatter with Snowflake Fresco Acrylic Paint to give it a more artistic feel. 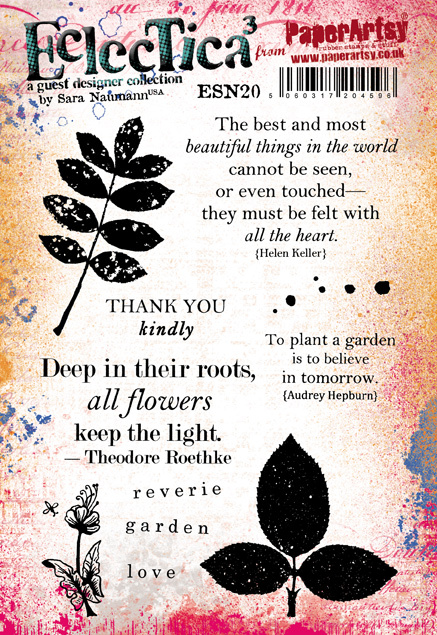 LOVE those leaves and quotes from the Sara Naumann stamp set. It adds so much to the dreamy background. The blue really makes for such a clean contrast with the white heat embossing and the Ginkgo leaves !! I certainly learned a lot in making this project. First thing was that you can very quickly overdo the brayering and fill up the whole background with color, which in this case was a problem for me! I have never used the pigment reinkers this way, and really had a tough time to figure out what to make and cover the theme and use the stamps to go with it. I wanted to enhance both those elements to the full! There are not many techniques that can only be done with re-inkers; most of the techniques can also be done with an ink pad. It was a fun project though, and I will try and use some Mica Gloss from Judikins with this brayering technique soon! I could not use them for this project as they are not re-inkers. I really hope you get inspired by our posts this fortnight and try some of the techniques we share, and of course enter the challenge to WIN! Hope you liked my project and see you next time! This is wonderful Ellie. Great technique. Looks wow!! Ellie. Love it. I love the tiles and those beautiful gingko leaves - this is gorgeous, Ellie. I can't comment over at yours any more, as it's only accepting Google+ comments at the moment, and I don't do that! So enjoyed reading your post. Such a unique project and absolutely stunning. Loving all the elements, the layering effect and the stamping. Great technique using the re-inkers and thank you for the fabulous inspiration....Learnt lots x. A really beautiful project, Ellie!!! Great technique Ellie and I love the result !